Notice steps in the form. Are they performed with smoothness, like water flowing? Or does the foot clunk down. Imagine that the foot is at the edge of a cliff. A smooth slide step out leading with the heel will let the body know what lies ahead, such as the edge of a cliff. A foot that opens out and steps down without the slide will lead the body off the cliff. Also, the slide step that is lead with the edge of the heal is actually a low kick. This same step could be completed with more space between the foot and the ground to become a kick leveled to an opponent. Notice the stretching out of the joints as reeling silk is performed. 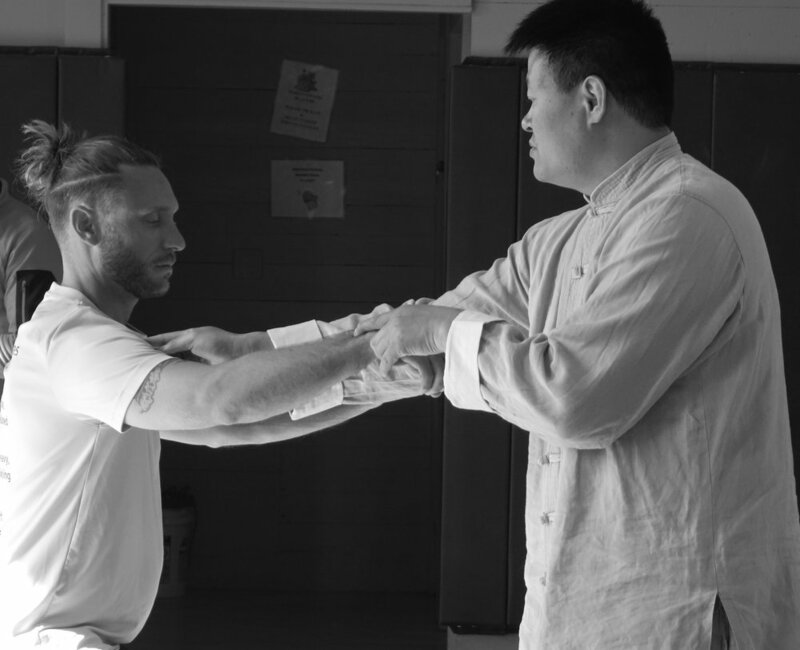 A light stretch of all of the joints: the shoulder, elbow, wrist, fingers allows chi to flow. Breathe through the ming men and out through the dantian. Slow even breath moving from the ming men through the body and returning to the dantien brings the chi to the dantian. Once chi fills the dantian the chi is available to circulate through the body. The elbows are not held too close to the body. They always create a circle with peng in the form, with push hands, with silk reeling, with standing post. Stretch out from the back to make the peng circle with the arms. Check for the elbows, do they need to drop, even slightly to become peng. An elbow that is even slightly lifted or turned outward too much is no longer peng and creates a vulnerability and a stiffness. If stiffness occurs in any of the joints then they are not open, are not peng and do not allow energy to flow through the body. When the elbow is stretched out and dropped the elbow will feel like a brick. An elbow that is dropped, correctly, will open the shoulder. The chi will move to the arms and to the hands which will become warm and/or prickly. The beginning form "chi xi" immediately uses all of the foundational elements of Chen Taiji. As the body sinks the knees fold slightly and are slightly turned in. This forms peng within the legs, creates an arch at the "qua", and an arch over all in the lower body. The hips bow out slightly and release at the buttocks. This bowing out at the hips causes the knees to slightly turn in to create the arch found in peng. Moving through the form one maintains peng throughout the body. This is seen in the rounded form of arms, shoulders, hips, back, legs, arm to hand. When the peng is not open and relaxed the body can become too tight. When the body is tight one cannot connect, connection is lost. Too loose and there is no power, no energy. Peng is like holding a baby. One cradles a baby gently. Too loose and the baby is dropped. Too tight and the baby is not comfortable and will feel the tension. As the form is practiced pay attention to the roundness at the joints. In performance of and holding of peng "there are no dead angles". The formation of an angle indicates a loss of peng, particularly at the elbow but also at the wrist or the knee or shoulder also. When the practice of the form includes an angle there is meaning to the angle. For instance when punching forward with the right fist the left elbow quickly moves backward in a strike. AS the student moves from punching down to the ground into the double scissor kick again there is an intentional angle made with the elbow in an elbow strike as the body moves 180 degrees from punching down to the double scissor kick. Practice generates heat as the chi begins to flow. Therefore it is important to practice more than one form. In the first form the body starts to warm up. In the second form the practitioner can check the body for alignment, for peng, ding, for any stuck spots. In the third form the chi begins to flow once the body is aligned, peng, loose, heavy, relaxed. This is like cooking chicken. The chicken needs time to warm up before it is tender. Practice is for health, for kung fu and for chi development and movement. "Peng" produces protection of the self, the body, and supports chi flow. Each arm/hand controls one side of the body. When the arm/hand crosses the mid-line one loses peng, and loses control. The right arm/hand controls the right side of the body. And the left controls the left side of the body. Each hand controls its own side of the body. When the hand crosses the center line peng is lost and when there is no peng there is no protection.